High visibility railings are an excellent choice for homeowners who want safety and aesthetics. Custom decks are for enjoyment, and glass balusters or panels help many homeowners enjoy their deck and outdoor space even more. Whether glass balusters or panels, high visibility railings are excellent for the safety of pets and children. With minimal space between balusters, it’s less likely little hands will be stuck. And with clear railings, added visibility allows you to watch kids and pets playing in the yard while kicking back in your lounge chair. 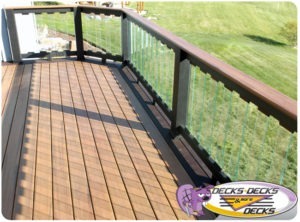 Decks with glass railings are also low maintenance and do not need to be stained, treated, painted or finished to maintain their beauty and durability. This is an important benefit because decks are continuously exposed to the sun, wind and water; and glass will not weather. Made of tempered glass, like a car windshield, it’s durable with little need for upkeep. Give our custom deck company a call to schedule a consultation and find out how you can increase enjoyment in your yard with a custom deck. This entry was posted in Custom Decks Omaha and tagged custom decks omaha, deck building omaha, decks omaha, Glass Balusters, High Visibility Railings on September 28, 2017 by Decks, Decks and More Decks.